The following drawings represent fighter aircraft guns which have been introduced into service since World War 2. As with the drawings in Appendix 4, they are not all drawn to precise scale so measurements should not be scaled from them. The approximate scale used is the same as in Annex 4, so the general size of the guns may be compared. Particular thanks are expressed to the Russian Aviation Research Trust for making material available from which most of the Soviet guns have been drawn. 1. Nudelman-Rikhter NR-23 (23 x 115) USSR. 2. Nudelman N-37 (37 x 155) USSR. The largest calibre post-war fighter gun to see service. 3. Nudelman-Rikhter NR-30 (30 x 155B) USSR. A version with a different-shaped barrel casing and a bulbous muzzle brake also exists. Hispano-Suiza HS 404, chambered for a more powerful cartridge. 5. 20mm M39 (20 x 102) USA. The only revolver cannon to be adopted for US service (so far). 6. 20mm M61 (20 x 102) USA. Six-barrel rotary cannon. 7. Gryazev-Shipunov GSh-23 (23 x 115) USSR. Twin-barrel gun, drawn from above. 8. 30mm Aden Mark 4 (30 x 113B) UK. The various Aden and the French DEFA/GIAT 540-550 series revolver cannon all looked very similar, the main visible differences being in barrel length (later GIAT guns having longer barrels than that shown). 9. 30mm Oerlikon KCA (30 x 173) Switzerland. Revolver cannon. 10. Mauser BK 27 (27 x 145B) Germany. Revolver cannon. Different muzzle attachments are used according to the installation. 11. Gryazev-Shipunov GSh-6-23 (23 x 115) Russia. 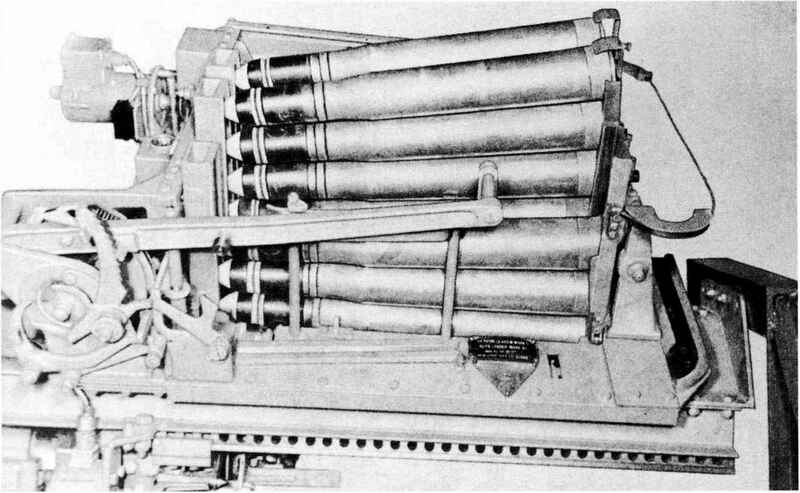 Six-barrel rotary cannon. 12. Gryazev-Shipunov GSh-301 (30 x 165) Russia. Recoil-operated.